Our dear Jackson Pollock, arguably the art world’s most influential American post-modern artist, created a lot of these numbered drip paintings. What is a drip painting? Pollock, like many artists from the postwar period, were very aware of humanity’s anxious and irrationality and therefore used abstract painting as a response to the uncertainty of the modern world. So naturally, he began to put canvas board and paper directly on the floor (who needs easels nowadays) and drip enamel paint in a controlled motion from above. Pollock began his numbered drip paintings between 1947 and 1950 when he was supposedly sober and in marital bliss to artist Lee Krasner. There’s a lot of head-scratching going on around Pollock’s drip paintings which is to be expected. I mean, how many times have we heard “My kid could do that!” I’m sorry no, little Jimmy cannot replicate any of Pollock’s drip paintings because the painstaking precision to detail makes it nearly impossible to replicate his artwork. Fun fact: a physics professor at my alma mater, The University of Oregon, Professor Richard P. Taylor was commissioned by the Pollock-Krasner Foundation as a leading expert in authenticating Jackson Pollock's drip paintings. To simplify, Professor Taylor has invented a technique known as "factuals" which helps identify consistent patterns in authentic drip paintings. Although there are “arguments” among physicists about how to properly authenticate a Jackson Pollock, many see the study of physics as a direct line to confirming and understanding Jackson Pollock’s artwork. Science, meet art; art meet science. The late 1940s and into the early 1950s were the beginning of the end for this mad, drunk genius. Peggy Guggenheim, super art patron extraordinaire, was instrumental in Pollock’s success, which included organizing his first international solo exhibition at the Museo Correr, Venice. During this time period life was good for Pollock, he was represented by Betty Parsons Gallery, and was selected by MoMA director Alfred H. Barr, Jr. for the Venice Biennale that year. By the end of the year, it is believed Pollock began drinking again, which began his own professional and personal demise. Number 18, 1950 can be found at the Solomon R. Guggenheim Museum in New York, along with a few other drippy trippy numbered paintings by the world’s favorite artist, Jack the Dripper Pollock. Kennedy, Randy. "The Case of Pollock’s Fractals Focuses on Physics." The New York Times, December 2, 2006. Accessed November 15, 2018. https://www.nytimes.com/2006/12/02/books/02frac.html. Remer, Ashley. "Jackson Pollock Overview and Analysis." The Art Story. 2018. 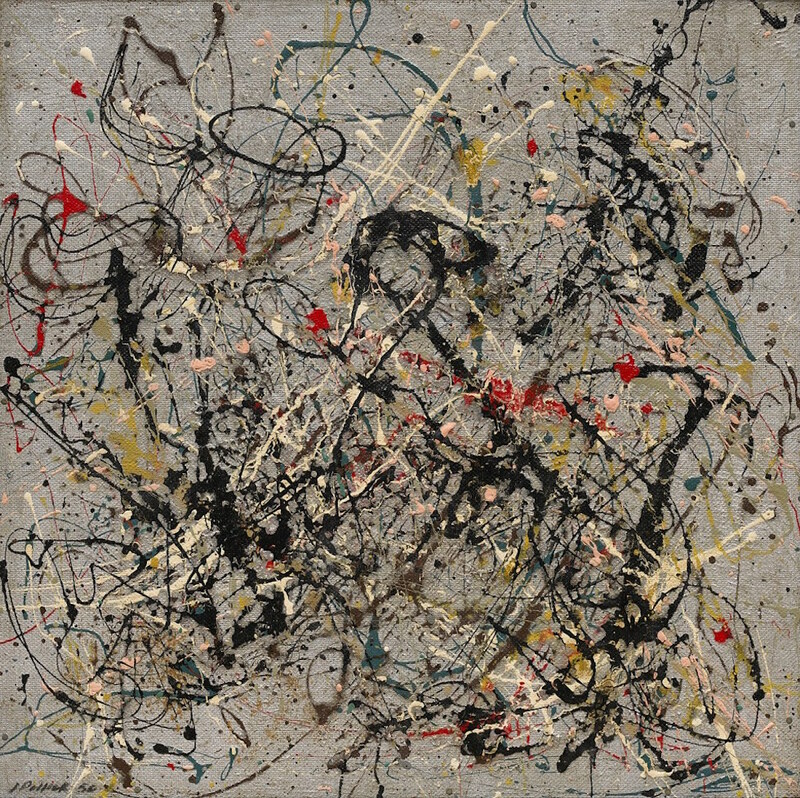 Accessed November 15, 2018. https://www.theartstory.org/artist-pollock-jackson.htm. Solomon R. Guggenheim Museum, ed. "Jackson Pollock Number 18." Accessed November 15, 2018. https://www.guggenheim.org/artwork/3484. Solomon R. Guggenheim Museum. "Jackson Pollock." Accessed November 15, 2018. https://www.guggenheim.org/artwork/artist/jackson-pollock.